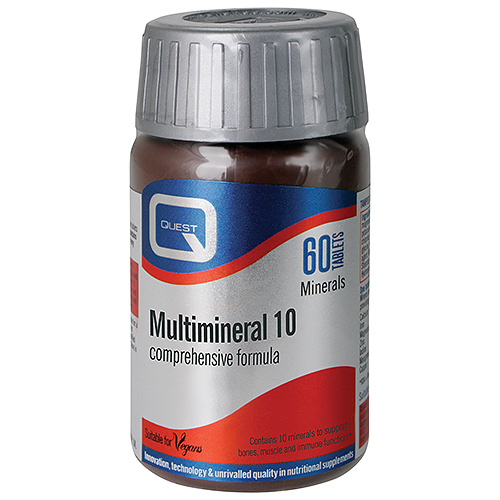 Quest Multimineral 10 is a complex formula providing 10 key amino acid chelated minerals including calcium and magnesium in a balanced ratio needed for the maintenance of normal bone and muscle function. The antioxidant minerals, selenium, zinc and copper help protect body cells from oxidative stress and support the normal function of the immune system. Mineral amino acid blend (providing calcium carbonate, magnesium oxide, ferrous sulphate, zinc oxide, copper sulphate, potassium iodide, manganese carbonate, sodium molybdate, chromium chloride, sodium selenite complexed with aspartic acid, citric acid, glycine, maltodextrin hydrolysed rice protein, sodium citrate), Bulking agent: Microcrystalline Cellulose, Lecithin (from soya), Magnesium Stearate; Anti-caking agent: Silicon Dioxide; Glazing Agent: Hydroxypropylmethylcellulose. As a food supplement, take one or two tablets daily with food. Swallow with water. This product contains iron which, if taken in excess, may be harmful to young children. Below are reviews of Quest Multimineral 10 - Complex Formula - 60 Tablets by bodykind customers. If you have tried this product we'd love to hear what you think so please leave a review. Been using it for years. A great mineral supplement to a modern diet. Nothing else like it on the market.